Aggieddad02 - Brian Enos's Forums... Maku mozo! Well tomorrow morning is go time for the right wrist, strong hand. Having the procedure done by an Orthopedic surgeon who specializes in doing the procedure endoscopically. I have a good friend who used this surgeon for his hands and he told me they did his second hand 2 weeks after the first. Planning to take a minimum of 3 months off from shooting and hopefully by that time I will be ready to return. I will let you folks know how it goes. I have used paint based markers on my mags and while they do work well, the down side is handling them over time wears the marking off. I have thought about getting an inexpensive engraving tool at Hobby Lobby and just lightly numbering the mags. The common denominator in any custom built gun is - you are going to have to wait. I see lots of posts regarding Atlas guns and they seem to be very favorable, likewise I see a lot of posts about Akai guns and they likewise are very favorable. Questions like the OP asked will always generate opinionated answers as there is no way to measure the quality of a gun. I have 2 limited Akai guns and Shay is working on my open gun at this very moment. I should have it right after the first of the year. I sent my first and only message to Shay today inquiring about the status and he immediately responded. 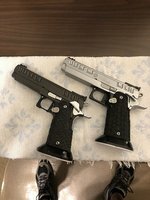 If you buy a gun from a reputable builder you should have no worries whatsoever. Best of luck on your decision and once you make your decision don't second guess it. How did you get your S/O into Shooting Sports? STI Grip for Smaller Hands. Which one? How did you save money for your 2011s?